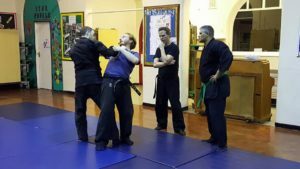 The Bujinkan Sevenoaks Dojo is the official Bujinkan Dojo for the Sevenoaks and North West Kent Area. We have been established in Dunton Green since April 2006 and have a strong and steadily growing student base. Here at the Sevenoaks Dojo, we study and practice the nine traditional schools of Japanese martial arts contained within the Bujinkan as taught by Dr. Massaki Hatsumi, Soke (Grandmaster) of the Bujinkan Dojo, based in Japan, with a particular emphasis on the Kihon (basics/fundamentals) of the Bujinkan martial arts. The Founder and chief instructor at the Bujinkan Sevenoaks Dojo is David Heslington and is he licensed by Dr. Massaki Hatsumi and he is assisted by his senior students, Steven Rodgers (8th Dan) and David Parker (6th Dan), at the Sevenoaks Dojo. 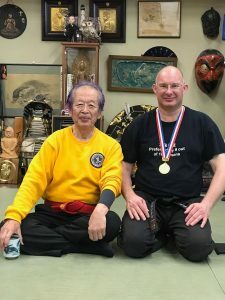 David has been training in the Bujinkan for a total of 30 years, is a Shidoshi (master instructor) and has been awarded the rank of Juugo (十五段 – 15th) Dan from Hatsumi Sensei . He is also a member of the Japanese Bujinkan Shidoshi-Kai (instructors association). 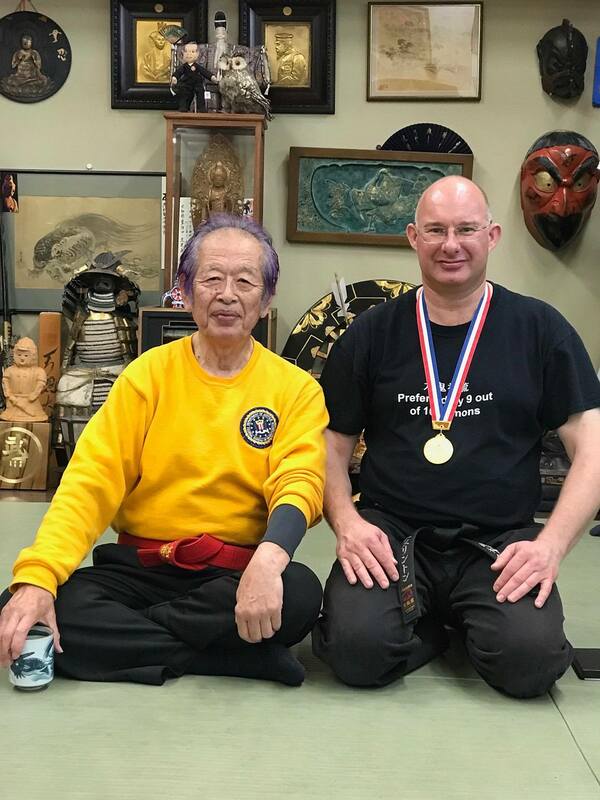 In October 2017, David was personally awarded the Bujinkan Gold Medal by Hatsumi Sensei during training at the Hombu Dojo. David has attended numerous UK & European Tai Kai (seminars) over the years and endeavours to travel to Japan at least once a year to learn from Hatsumi Sensei, the leading Japanese Shihan (master teachers) and other western students residing in Japan, that are studying in the Bujinkan. 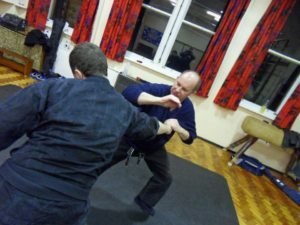 David trains every week with Dai Shihan Peter King (15th Dan), the senior instructor in the UK, at the Bujinkan King Dojo, and also with fellow Shihan Stephen Boddy at the Bujinkan Mid Kent Dojo when possible. He also attends seminars both in the UK & Europe whenever possible, to learn from other visiting instructors. David is also a certified Hichibuku Seitaijutsu therapist, having completed a four year course in the Amatsu Tatara Hichibuku Goshinjutsu with Peter King. The Hichibuku is a form of traditional Japanese medicine, which also forms an integral part of our studies within the Bujinkan. If you would like to know more about this subject, please see our links section for further information on this fascinating area of study. Training at the Bujinkan Sevenoks Dojo takes the form of paired exercises/practice. Unlike other sports based martial arts, such as Karate, Judo, etc. there no is competitive aspect to our training. Rather, the opposite is the norm. In order for the training to be safe and productive, there is a need for trust and co-operation from both partners. If you are constantly getting injured during any form of martial arts training, then we are clearly doing something wrong. The practice of any martial art should be to protect, maintain and promote the health of the practitioner’s body, not to damage it. Classes are comprised of mixed ability students, from beginners to black belts. We do not divide a class into grade, weight or age groups, so you could find yourself training with a complete beginner or one of the senior black belt students. Students at the Bujinkan Sevenoaks Dojo currently hold ranks from 10th Kyu (beginner) to 8th Dan. In the Bujinkan, we feel that everyone has something to offer during training, no matter what grade they are. Instruction often takes the form of what is known in Japan as ‘Ishi Shoden’ (person to person/one to one transmission). Followed by the particular lesson of the day, which may be based on the year’s current theme or a particular school, technique, idea or weapon. At the Bujinkan Sevenoaks Dojo we actively encourage all members/students of the club to travel to Japan, either as part of a club group trip or individually, in order that they may have the opportunity to train with Hatsumi Sensei and the other senior Japanese teachers, and also to attend seminars both within the UK, Europe and further afield whenever possible. There is no requirement for a minimum period of training or grade that must be undertaken for travelling to Japan or to attend seminars. Training in the Bujinkan is open to both men & women who wish to learn the traditional Japanese martial arts. 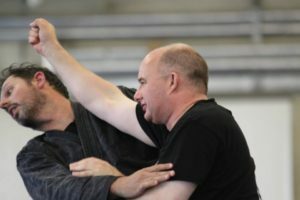 Even though the techniques of the Bujinkan stem from the Medieval period of Japan, they are still ideal and relevant for today’s modern world and society. No previous martial arts experience is necessary, nor do you need to be especially fit to participate. To participate in training you should be over 18 years of age, however, with parental consent, younger people may train, ideally with someone of their own age group. In all cases, the minimum age will be 16. There is no upper age limit. Please see the guidelines section for further information. It is not necessary for students to purchase any special clothing or equipment to start with, until you are sure you want to continue training. Initially participants should wear loose clothing, such as a pair of tracksuit bottoms, a T-shirt or sweat shirt. Rather than bare feet, it is preferable that you wear socks to keep your feet warm and clean. Insurance: Club group/member to member insurance through the BBMACO is now closed. We would advise all prospective new students to arrange their own insurance. We recommend that all prospective students take out insurance, as the practice of martial arts is not without risk. Please note the above are not endorsed by Bujinkan Sevenoaks Dojo.